Interpreting the Civil War: Only Hindsight: Where are the Historian Futurists? 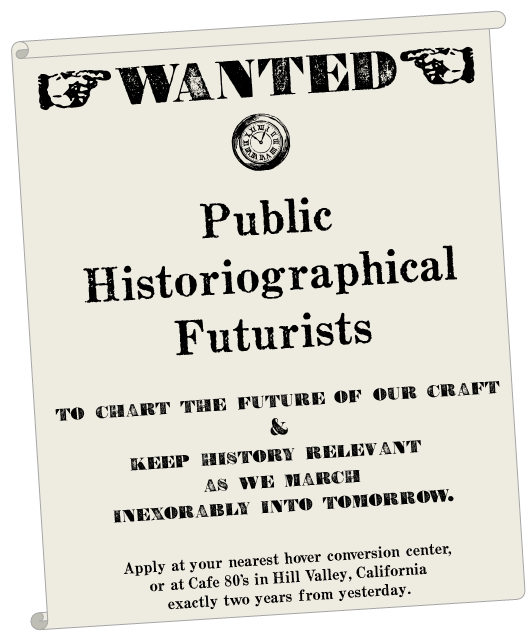 Only Hindsight: Where are the Historian Futurists? A friend who is planning a pie-in-the-sky conference (about which I'm super excited) texted me today with a quick question. "Who would be a good 'Historian of the Future?'" he asked, adding the bonus that I could dream big. "Money no object," the next text read. I was at a loss for a few minutes. Who is the historian of the future? Who is trying to visualize that skill-set, categorize that life, read the trends of the past and plot the course of history yet to come? My work with the NPS, and my penchant for soaking up Sci-Fi culture and fiction, has led me into contact with that interesting field known as Futurism or Futurology. No joke. It's a thing, look it up. just probably not on paper. Futurists, in short, try to look to the future by studying the trends of yesterday and today. They are plotting out the probability lines for where mankind might drift. More generally, the label includes such disparate lay, professional, and academic groups as visionaries, foresight consultants, corporate strategists, policy analysts, cultural critics, planners, marketers, forecasters, prediction market developers, roadmappers, operations researchers, investment managers, actuaries and other risk analyzers, and future-oriented individuals educated in every academic discipline, including anthropology, complexity studies, computer science, economics, engineering, Urban design, evolutionary biology, history, management, mathematics, philosophy, physical sciences, political science, psychology, sociology, systems theory, technology studies, and other disciplines. Historians are on that list, buried in there with their brethren sociologists and anthropologists. But where I see the sociologists trying to puzzle out the future, where I see the anthropologists attempting to see where man might move next, I don't see historians practicing futurism as futurists, simply as historians of futurism. A quick Google survey confirmed this inkling. On one level, it makes perfect sense. Historians are chiefly concerned with the word of the past. We hunt sources and documents, read ancient letters and granite monoliths as texts left behind by a race often long gone, sometimes by decades, sometimes millennia. Historians, though, taken as a group, tend to be wholly retrospective. We look back at closed systems, oftentimes ceaselessly complex systems, but still inherently closed with a finite amount of data in play. The best historians play those systems off of the modern era, helping to use the complex system of the past to show that where we are today makes sense, that all the effects have a cause somewhere. Even when we are studying the field of history, we section off the past into eras and epochs. The Dunning School, though it may express itself in dribs and drabs today, was the 1910s to the 1950s. It is a fixed point in time, with impacts on the present, but often simply studied as an event like every other chunk of history. Futurism has had an influence on the field of history, but seemingly that influence has been mostly epistemological and functional. Asa Briggs summed up his view of how futurism might influence the historian's craft in a very good 1978 article as, in essence, a framework to investigate problems in the past, using the thought processes of the futurist. But that's not quite what I mean either. of the history of the Civil War. of the Civil War. Dizzy yet? So what am I hunting, then? Futurists use the trends of the past and present to outline where the future lies. Where we have a great dearth of work among historians, particularly in the Civil War field, is in applying futurism exactly as it is wrought, what I would term Historiographical Futurism. OK, I just made up a useful concept, but play with me for a moment before I layer yet more frosting on the funky cake. Where is the study of history, where are the trends and (to put it in a vulgar sense) fads which express themselves today heading? What might the act of studying the past 5 or 10 years from now functionally look like? How might technology and shifting social structures alter how we study the past next year, next decade, next century? What is the future of history? These are the futurist's questions about history, not within the flow of history. To put it quite succinctly: whither the craft? OK, on to that added frosting. If there are inherent questions framed around Historiographical Futurism, then there can also be those revolving around Public Historiographical Futurism. Where is the practice of history with the public heading? What might the act of interpretation 5 or 10 years from now functionally look like? How might technology and shifting social structures alter how we interpret historical resources with the publics next year, next decade, next century? 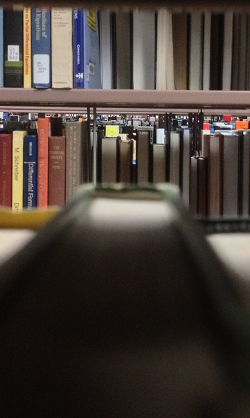 What is the future of public history? And there we his this funky wall. Historians are very busy living in the present, crafting understandings of the past today. I'm not quite sure, in either ends of the historical house, we're very concerned with the future of our profession, only it's base, short-term maintenance. Ed Ayers, now the president of the University of Richmond, was very big in envisioning public usable pasts and vibrant databases, trying to chart the course to a future not yet created. The Valley of the Shadow project was truly earth-shattering when it hit the web in early 1990s, thanks to Ayers' inspiration and the work of the Institute of Advanced Technology in the Humanities at the University of Virginia. Ayers has hopped into one future of history in co-hosting BackStory, one of few historians leaping on the podcast train in an engaging and meaningful way. Nina Simon, too, is piloting the future, both with her physical work as director of the Santa Cruz Museum of Art & History and her virtual futurist way-finding work at Museum 2.0. Some of her ideas are amazingly precient, and the shifts she's made in her museum's offerings have shown real changes in numbers and participation, data validation that perhaps some of her visions of the future might be feasible. Larry Cebula rounds out my list, prof. at Eastern Washington University and editor of Northwest History Larry talks shop in nearly every aspect of the future of the field, particularly virtual visitor experiences and digital archiving. I first met Larry when I bummed around the OAH conference in Milwaukee last year, where he was pimping the Spokane Historical app. Those were my three names for my friend when he asked, "Who would be a good 'Historian of the Future?'" Hey, I recognize that 1981 green carpet!